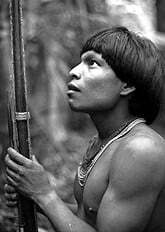 The Motilon, Bari are an indigenous people group who have come to the USA from their countries of origin in Venezuela and Colombia. They are also known by the alternate names of Motilón, Motilone, and Barí. Globally, they number just 9,200 people. Approximately 1,000 have come to the USA in search of better economic opportunities. Their primary language is Barí. The missionary Bruce Olson began pioneering efforts among the Motilon, Bari in the 1960's, and became the blood brother of a chieftain's son. Many of them became evangelical Christians due to his work and the translation of the Bible into their language. He's considered the most influential cause behind the "Motilone Miracle", of indigenously-run schools, literacy programs, medical clinics, as well as a concerted effort of the Motilon, Bari to reach out with the gospel of Jesus Christ to surrounding tribes. Although there are no congregations of Motion, Bari in the United States, a number of them are reported to be evangelical believers. Pray for Motilon, Bari believers in their homelands to be bold in spreading their faith to unreached people around them. They have a plan to reach out with the gospel to 18 other surrounding tribes. Pray for Motilon, Bari in the USA, that they will stay true to their faith and be active in sharing with others.